These days, even the most powerful PC is not of much use without a solid Internet connection. And even if your connection is great, do you know how much data you consume, and at what rates? And can you tell which applications are connecting to the Internet, and where they're connecting to? NetSpeedMonitor is a small, unobtrusive donationware utility that can help you answer all of these questions. NetSpeedMonitor displays a stylish, custom tooltip showing connection performance and metrics. Unlike Casper Bandwidth Monitor and other monitoring applications, NetSpeedMonitor doesn't use a window--nor does it silently sit in the system tray. To display connection speeds, NetSpeedMonitor creates a new toolbar for the Windows taskbar. This toolbar sits next to the system tray (where the clock and the tiny icons reside), and displays download and upload speeds. The default display is wide and did not work well with my vertical taskbar. A quick visit to the configuration dialog, accessible by right-clicking the toolbar, fixed that. I was able to reduce the labels and make the counter fit nicely even in a vertical taskbar. NetSpeedMonitor can show which processes on your system use TCP and UDP connections, and where those connections lead. When you hover the cursor over the toolbar, NetSpeedMonitor shows a custom pop-up with the current upload and download bitrates (which you can see on the toolbar anyway), as well as monthly, daily, and session transfer tallies, so you know how many bytes you uploaded and downloaded over those time spans. This pop-up is well-designed, but the data tallies are not followed by any unit count, so you will have to guess whether "32" means 32KB, 32MB, or 32GB. If you're not sure which one it is, you can find out by right-clicking the toolbar and clicking Data Traffic. This opens a dialog where you can see those tallies again, and configure the unit used (MB, by default). The popup worked well when my taskbar was in the horizontal position, but it flickered badly when I tried to use it with a vertical taskbar. 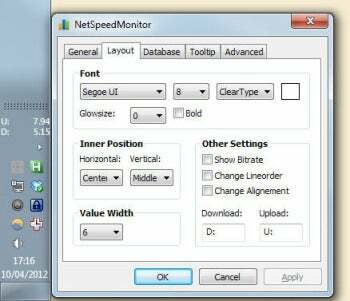 NetSpeedMonitor's toolbar can be customized so it takes up minimal horizontal space, and works well with vertical taskbars. 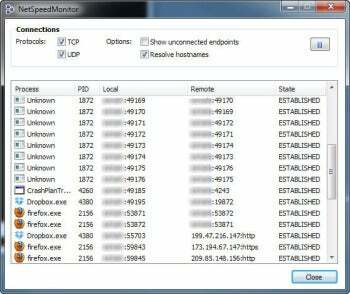 Apart from the configuration and Data Traffic dialogs, NetSpeedMonitor has one more dialog: Connections. This is the most technical of all three dialogs, and it shows a list of running processes which have established, listening, or closed TCP and UDP connection endpoints. Basically, it shows you a list of applications who are trying to go online, as well as where these applications are trying to connect. The list is a bit tricky to use, because some of the processes are marked as Unknown; NetSpeedMonitor can't find their name. It does, however, report their PID (process ID), and you can then run Process Explorer or Task Manager and find what process that PID belongs to. In my case, it was CrashPlan, and I could see its PID only after I elevated Task Manager to show processes from all users. While the Connections dialog is mainly useful for developers and/or very technical users, the rest of NetSpeedMonitor is easy, fast, and friendly. NetSpeedMonitor is offered for free, but its developer accepts donations for his work. Simple and powerful utility NetSpeedMonitor keeps track of Internet connection speeds.